The recent ‘Third Gaza war‘ or ‘Operation Protective Edge has raised ire and protest around the world; some countries withdrew ambassadors from Israel, others protested loudly. It was a costly war as well for Israel, estimated at $4 billion or more. One of the biggest issues has been the high number of civilian casualties in Gaza; an issue which is itself not easy to come by an exact count, as the New York Times illustrates. Estimates from UNICEF and others put the numbers around 1,700-1,850 people killed in Gaza, of which around 400 were children. This war raises many issues. Israel has declared victory, as has Hamas. 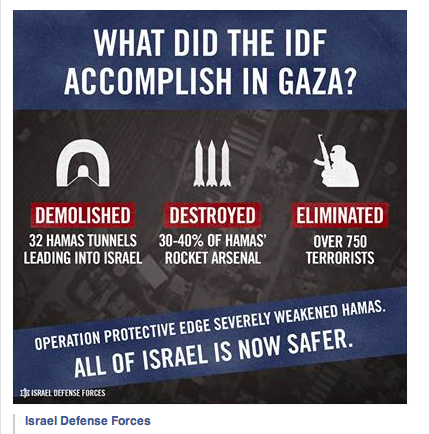 But if the objective was to raise deterrence for Hamas, it doesn’t seem the goal was accomplished. Hamas celebrated as 23 fighters emerged from a collapsed tunnel in Khan Yunis. 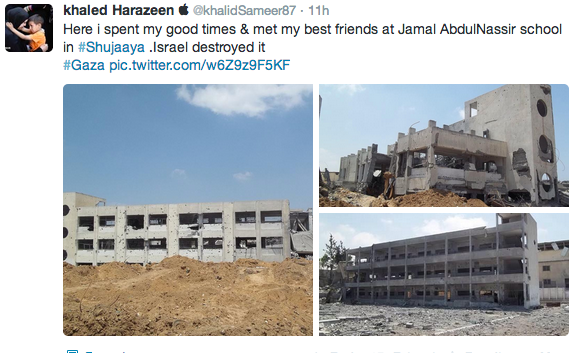 An Al-Jazeera reporter was supposedly taken on a tour of “special advanced positions” by Hamas. Let’s look at a few issues about this conflict that are worth considering. 1) Many Jewish voices have come out claiming the main issue of this war has been how it reflects on Jewish communities. Some looked at it philosophically and in light of Hebrew scripture. Two J Street members argue “We cannot, however, as American Jewish friends of Israel, turn a blind eye to the plight of Gazan civilians.” In a sense this war, for many American and diaspora Jews, was a war of “we.” This knee-jerk “we” reaction has created a self-centered dialouge that posits the main “problem” with the Gaza war was how it reflected on Jewish communities worldwide. For instance Rabbi Eric Yoffie writes: “Netanyahu can only bring back disillusioned liberal Jews such as Jonathan Chait, Roger Cohen, and Ezra Klein by enhancing Abbas’ status in the ceasefire talks, backing a settlement freeze and showing he hasn’t abandoned the two state solution.” The idea is that Israel’s requirements for security and Gaza’s suffering, are only really important in terms of how they please a few Americans. Yehuda Shaul at The Jewish Week asks “what have we become.” This exclusionary and inclusive we is problematic. It posits that all Jews are a collective “we” and that therefore all can be blamed for Israel’s actions, a classic anti-semitic canard. A fact I addressed in a column at the ‘Post’. It is also very self-centered, which I examined at Mida. The main problem with Gaza’s civilian casualties is not how it reflects on “Israeli morality”, the main problem is that there were casualties. 2) Just examining the civilian casualties issue by itself raises interesting issues. 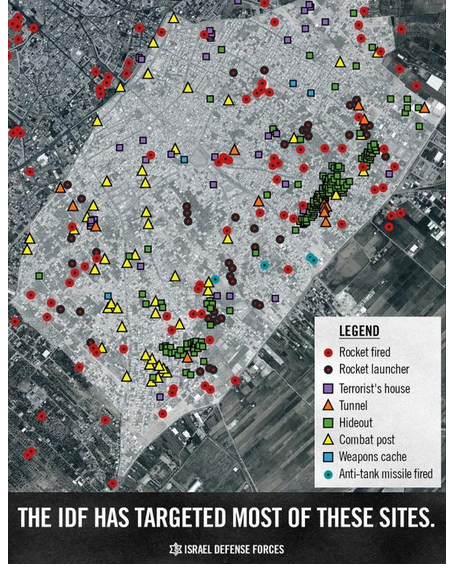 The central Israeli government and military view is that Hamas used human shields, either directly or indirectly by caching weapons in civilian areas. The maps they produce illustrate how complicated the military mission fighting in an urban area was. But it also raises a problem that few discuss. During the war several “gotcha” moments were produced. 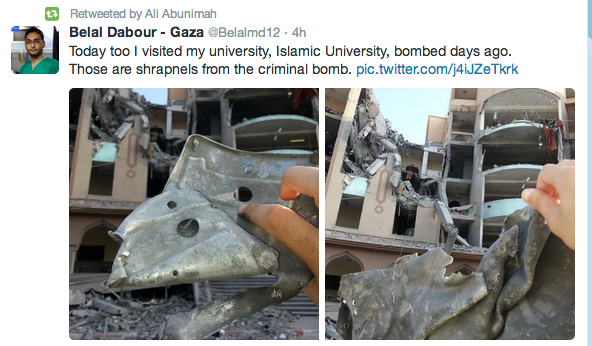 In some cases reporters left Gaza and then claimed they had seen rockets fired next to hospitals or schools. In one case an Indian TV crew filmed how Hamas set up a remote rocket launcher near a UN facility. France24 also had several run ins with rockets fired near their crew or discovering rocket launchers in civilian areas. But as others pointed out, such as Hilary Clinton, “Gaza is pretty small”, so the presence of civilians is a given; although others claim that Hamas could use open areas. That wasn’t a secret to the Israeli army, which dropped leaflets and warned people of coming destruction through hitting their houses with smaller ordinance first (“knock on the door”) or ordering civilians to leave areas. Many pointed out that the number of civilian casualties in the US war in Iraq was far higher. In my interview with Col. Richard Kemp, he made the same point about the UK forces in Afghanistan and Iraq. But there is still a “wait a sec” moment that needs to be had. Go back to the footage of the Hamas rocket being set up. So the IDF knows the rocket is fired from this area. 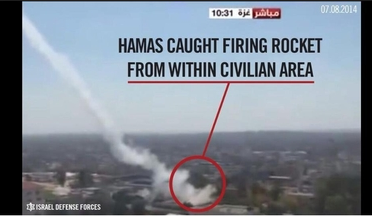 But the IDF certainly should know what the TV cameraman knows: The Hamas rocket crew has long since left the area. So how would shelling it help? What is the objective achieved in hitting the rocket launch site? Already the chorus of voices calling for “war crimes” investigations is being raised against Israel. The view is that they are biased. But again, let’s pause and consider an important issue raised above. If the IDF knew that the civilian areas are where the rockets are launched from, in terms of the doctrine or proportionality and distinction, i.e it is acceptable under int’l law to have collateral civilian damage but it depends on the objective, what exactly is the objective that was accomplished? When one looks at the damage done to universities or civilian infrastructure, what exactly was the objective met in these locations? 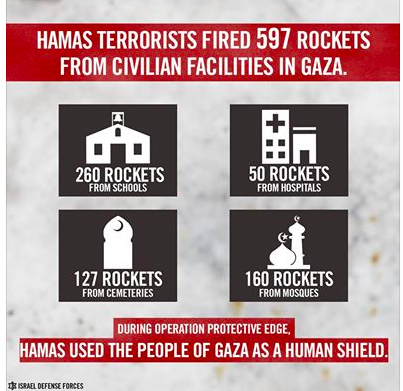 Everyone can agree, except for the radical left who claims Hamas rockets are “fireworks” or as Jay Michaelson claimed “impotent” or Geraldo who said they are “imprecise”; that they come from civilian areas. But is there any assumption Hamas rocket teams were actually hit, when large scale destruction was visited after the firing? Other videos show precision strikes where the IDF says it “caused no damage” to nearby mosques, so in cases with widespread damage, why not use the precision ordinance? There will likely be no new Goldstone-style investigation after this Gaza war. Even though groups like Amnesty International and others want there to be. But it is worth considering this central problem of fighting in civilian areas. If people are known to fight from them; and the videos show that the perpetrators fire weapons and then melt away; how does an airstrike or artillery strike minutes later change anything? The whole discussion about “morality” misses this as well, because it is Israelocentric and Jewish-centric. It isn’t really about asking real questions. It takes at face value that children were targeted and killed in Gaza. It is an argument about “morality”, not about military effectiveness or logic. But there should be a discussion about military effectiveness. Was bombing all these places in Gaza effective. How many Hamas fighters were killed? 200? 300? 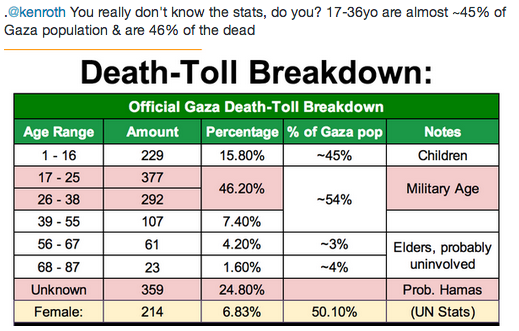 And if the ratio of Hamas dead to IDF dead is 300:60, what does that mean? What was the ratio of “military targets” laid waste, to civilian areas? We may never know, because anti-Israel people talk about dead children, and pro-Israel people talk about Hamas missiles. There is no major narrative that accepts the necessity for war but looks at some of the details within it. 3) An interesting debate now being had is that because Israel is claiming 750-1,000 of those killed are men of ‘fighting age‘, which assumes that any man aged 20-29, for instance, is a Hamas fighter just because they are over-represented among the dead. It is a neat trick of statistics to re-classify them as combatants without necessarily knowing they are. It would not make sense from the other side, for Hamas to simply claim that since Israelis in their 20s conceivably might be eligible to be in the army, therefore their deaths are legitimate? It goes to the heart of problematic logic about this war. Israel says Hamas fires from civilian areas, making those areas legitimate targets; while at the same time the presence of the IDF in civilian Israeli areas does not, according to the discussions, make those areas, say around the Kirya in Tel Aviv, eligible targets for Hamas. How many Hamas fighters have been killed. In the barrage on Rafah on August 2nd many came forward and said that a disproportionate number of the 100 or so killed were men, as if the very fact of them being men made them eligible targets. It goes to the heart of a misunderstanding of Gaza. 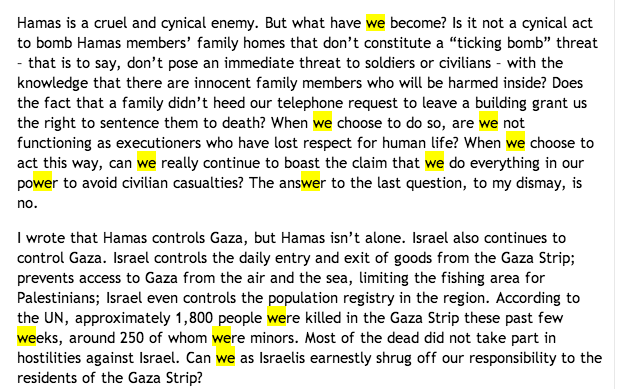 People may be Hamas supporters or even “members” in some way, but are all of them eligible targets in war? If there is a Hamas commander and his house is a target, are the other men in the house assumed to be “Hamas fighters”? The problem in the end is we don’t know. We don’t know enough about this war and about the casualties and about how numbers are generated and determinations made. Is it “indiscriminate” killing? No. But is it “discriminate”, and if so how? And is it effective? 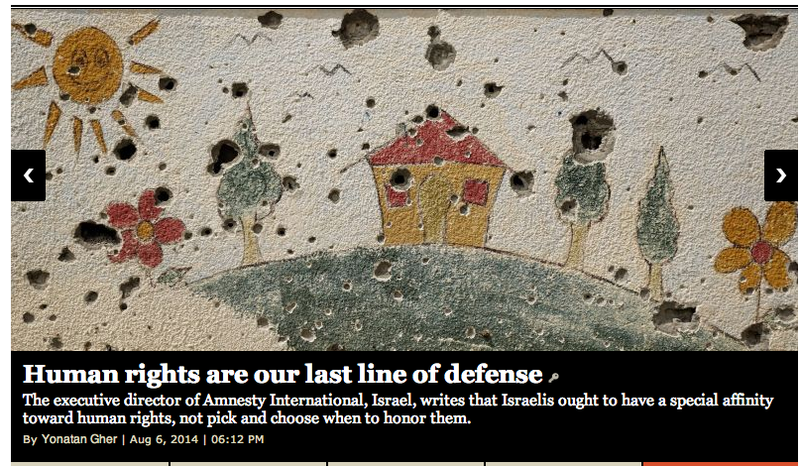 4) With Hamas ending the ceasefire on Friday August 8, it seems the war goes on. A poll done by the IDC seems to indicate most Gazans want “peace” and “reconstruction.” But what the poll doesn’t ask is what they mean by “peace.” Do they mean also an end to the blockade? Many (67%) do not blame Hamas for the destruction in Gaza. By simply asking “do you want peace”, it is a nebulous question like “do you want to be happy? Yes. But how do you define happiness? Is there a long term vision for Gaza by Israel’s leaders? The EU proposals to bring in a shipping corridor is nice, but like the plans to turn Gaza into “Singapore”, it seems far fetched. Already the Airport and the Greenhouses and other investments have been ruined in Gaza and the EUBAM mission at Rafah has never been effectively implemented.